No tools or assembly required! Reclaim your bathrooms with space-saving Bottoms Bathroom Tissue Holder. 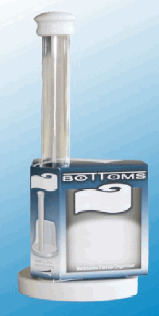 Each durable plastic Bottoms holds two tissue rolls and mounts easily on the inside of your cabinet or vanity door.